Life has settled a bit now so I can start blogging again and share my experiences with the cards for those who are interested. I’ll be expanding this blog to include more posts on other divination systems and the first set of new posts will be about ones I have been exploring in my tarot break. Looking forward to sharing them all! How can I make the most of new opportunities at work? Interesting to see the Eight of Coins here today as I had been reflecting on my last reading and come to see this as also signifying the offer of a pay increase in recognition of my skills. It makes sense for this to appear in this work focussed question. 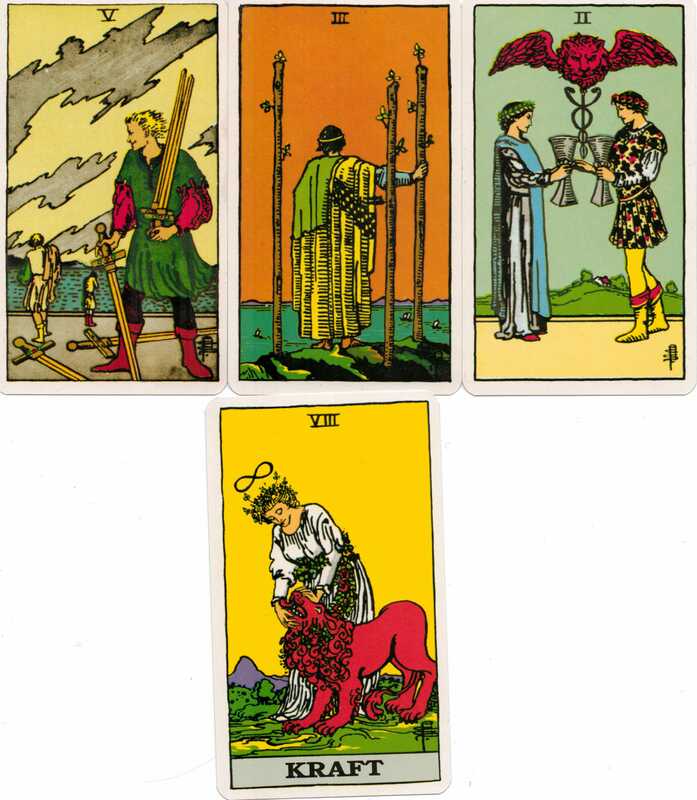 The Devil as the first card suggests that it will not be easy to make the most of the new opportunities presented to me. It can stand for an unhealthy obsession and clinging on. I also see it those things which seem very tempting on the surface and which encourage us to throw long-term caution to the wind in pursuit of a short-term fix of pleasure. It is unrestrained impulse. Paul Huson also suggests in his LWB that this card can stand for tyranny which brings adversity. This fits quite well with what I know of my workplace. There is a tyranny of sorts in that the same small group of people have been in charge for a very long time and it is difficult to propose something new. There is a clinging to an old system which is driven by passion and very strong feeling. The temptation may also be to simply work too hard. There is an interesting expression ‘working like a demon’ which has connotations of being obsessed with work and never giving yourself a break. The Four of Swords often has the meaning of rest or retirement. In this situation, I can see it as advice to remove myself from the passions represented by that Devil and take time out to contemplate the situation carefully. It can also indicate a retirement. Well, I’m nowhere near retirement age but wonder if there might be an unexpected development for someone else. The Eight of Coins brings the reward and recognition for hard work and a job done well. I’m not really one for doing daily draws with cards – a few times a week is quite sufficient for me – so for the last few days I have spent some time simply shuffling my deck and looking carefully at the cards. There are all sorts of interesting little symbols which have particular meaning and add dimension to readings. I’ve also downloaded the extended LWB from Lo Scarabeo’s site which helps to explain some of the imagery which piqued my interest. It is obvious that Paul Huson has put a huge amount of scholarship into this deck – it’s one of those where things appear in the imagery quite deliberately. It’s a fascinating trail to follow. I’ll write a post detailing some of these soon. 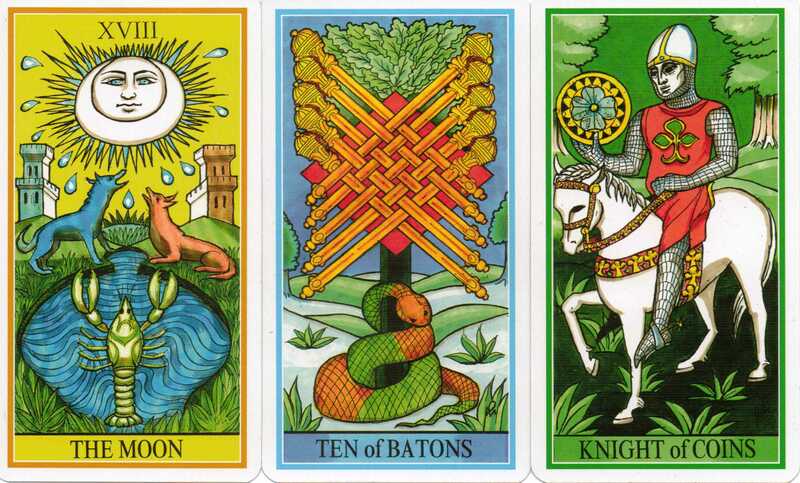 In the meantime, here is my three card draw for today. The first card I pulled is the Significator. It is supposed to represent the person asking the question. I didn’t deliberately choose this card but picked it at random. When this happens, I tend to see the message in the other cards as being particularly significant for me. The Eight of Coins shows a young woman handing over some money to pay for a fabulous crown being fashioned by the craftsman. There is obviously some important occasion coming up where she will need to dress her best. 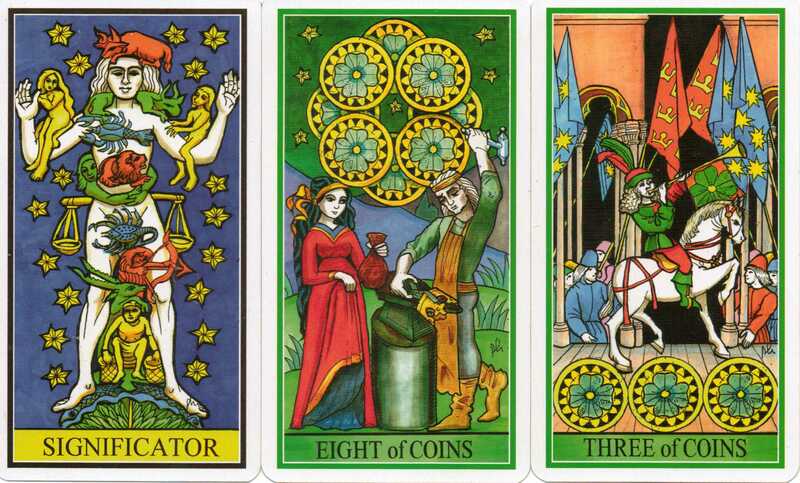 The Three of Coins has a herald sharing some news – someone of importance is coming to visit. The clover shows that this is someone held in great esteem. Suddenly, the need for the woman to look her best becomes clear. 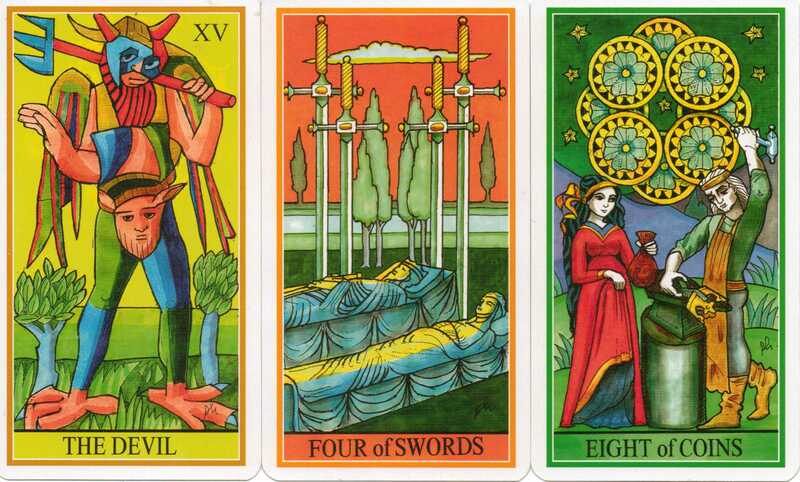 These cards suggest to me that I may need to splash out on a new outfit to prepare for an important visitor. It seems to be linked to a work event. Alternatively, I may be the craftsman and need to help someone else put on their best possible face. I’ve made the decision to go back and use a favourite deck intensively for a while. In my foray of trying out a different deck every week I really learnt what type of deck suits me and which are best left as collectors items. It has meant that I have became far less likely to jump on the latest releases thanks to enthusiastic gushing of others. My bank balance is also quite thankful. 🙂 I’ve been craving time with just one deck for a long time – the weekly deck-hopping just wasn’t satisfying me anymore. Enter Dame Fortune’s Wheel! Regular readers will remember how much I enjoyed using Dame Fortune’s Wheel created by Paul Huson and published by Lo Scarabeo. It is based on Etteilla’s meanings rather than RWS/Golden Dawn and that is very appealing at the moment. So I’m afraid there won’t be much variety here for a while – at least until the Spring Equinox – but I’m looking forward to delving deeper with this little gem. My eye is immediately drawn to the snake in the centre who is curled round the tree but looks ready to strike and protect what is his. It is a card which warns of cheating. Someone is planning a ruse and all is not quite as it may seem. There is a little hint of hypocrisy. The way he is curled round the tree makes me think that this snake is acting out of self-interest and wants to protect what is his. The Moon brings an increase but can also indicate that something is hidden in the half-light. A time of growth approaches but something else lurks. It seems that this snake is what is hiding in the shadows – he acts as a second warning that something is ‘false’, things are not as they may appear. With the moon, I’m inclined to think that it is my perceptions which are false or that I’m being false to protect something which is important to me. The Knight of Coins brings something useful, an advantage of some sort. It is this which the snake would like to protect. Overall, there is a message of a time of increase and something advantageous coming my way. However, there is a falseness to it – whether this is a hidden pitfall to what seems positive on the surface or a need to be sly and false myself to protect it, might be too early to say. I like the fact that it is adaptable and can be shortened if an in-depth or predictive reading is not required. It’s been a while since I’ve done something in-depth for myself beyond the usual 2 or 3 card draws and the beginning of a new year is always a good time to take stock. I have come from a place of hope and healing. The Star suggests a difficult time where I may have looked to spiritual guidance or direction. It often prompts questions in me of whether or not I’m on the right path – is this destined to succeed/fail? It gives the hope that what I seek is possible even if it isn’t here yet. I feel like I have been in this hopeful place for a long time and today I finally had some news which gives it more substance. This brings to mind a situation where a fair and impartial judgement will be called for. It will require rational thought as well as keeping eye on the long-term strategy. It will be important not to act rashly but to consider all possibilities. As far as possible, I will need to keep emotions out of the choice. This will not be easy as I tend to think with my heart rather than my head at times. I am affected by a journey I made recently from a difficult place. I got in that boat and left, hoping to find less choppy waters or even the greener grass on the other side of the river bank. However, I have struggled to leave the emotional baggage behind and have instead carried it with me. In some ways it keeps me in a circular loop with the Star – I keep going over old ground and trying to see if there is some higher message instead of letting go and allowing myself to heal. The King of Swords energy would be very useful here to help me take a dispassionate look and see what ballast can be cut free. The first phrase which sprang to mind was to stop tying myself in knots. I see myself as bound and imprisoned but those ties and swords are my own creations. I feel restricted but if I could just removes the blindfold, I would see that the way ahead is clear. The Empress brings a call to nurture. I think here there is a message to nurture myself, to treat myself gently. It is also a call to creativity – the Empress is pregnant with creation and abundance and I need to tap into that flow within myself. In particular, I see this card as a reminder that I can create my own abundance. It’s time to embody that Empress energy in my own life. The 5 of Swords is such an ambiguous card for me. Sometimes I identify with the winner but mostly I feel that I’ve come out on the losing end of a fight. This time it is the winner which stands out to me. There will be a battle of wits which, for once, I could win. Again, the King of Swords influence is felt here – I need to keep my cool and not let emotional entanglements get the better of me. 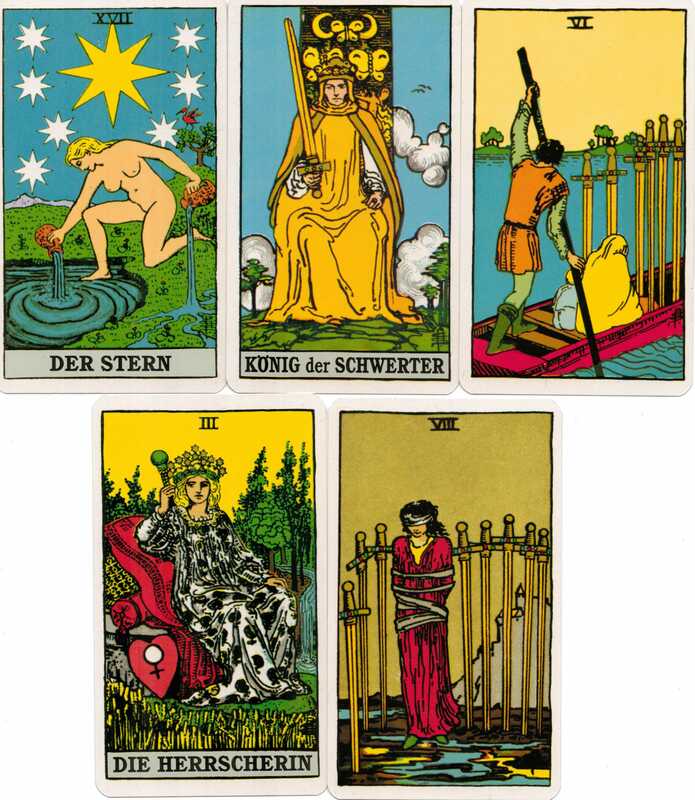 The 3 of Wands points to coming results in a new endeavour – the idea has been launched and the ships will start to come in. The 2 of Cups brings with it the promise of a new partnership. This is a positive end to the spread. Despite some tough experiences, I have the strength to get through them. I often think of this card as a sort of moral strength too. At least some of my tough experiences recently have come from an unwillingness to compromise my ideals and ‘play the game’. There seems to be a thread running through this reading that it might actually be necessary for me to play a ‘game’ in a battle of wits but that I can keep hold of that sense of fairness.